The Messenger API provides the simplicity that you are looking for when enabling your applications to send SMS messages. Sending a message is as easy as POSTing a web form. To use the API simply authenticate your user and POST method parameters to the Messenger server in the same way that a browser would. To do this method parameters are first HTML form encoded and then submitted in a HTTP POST. This is well supported in most development environments. Note: The number and order of parameters may vary. The parameter names described in this document will not change, however new parameters may be added from time to time. Using a REST API is straightforward - no mucking around with XML and a very simple interface. It is best to get familiar with the REST API outside of your code first - so that you can get a feel of how it hangs together without writing stuff and realising there may have been an oversight. We can recommend Postman as a way to easily construct the API calls to Messenger - including saving them for later reference. cURL is an awesome old-school tool for fetching and putting to web URL's from the command line. There is even a Windows version if you don't fancy using a GUI as mentioned above. Because cURL is a command line tool you can build it into scripts such as Bash shell scripts and use those to interact with the Messenger API. Perfect if you don't want to start involving developers. Before we allow use of our APIs you must first authenticate yourself, so we know who you are. API calls can be authenticated in a few different ways, but all options are underpinned by SSL/TLS encryption for security. 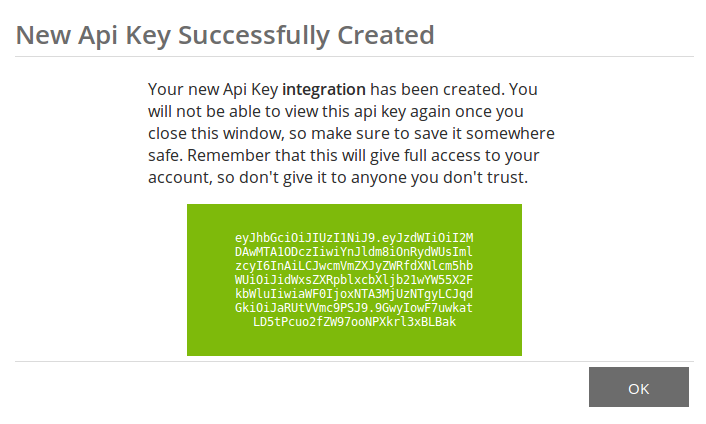 An API key can be manually created from within Messenger on the My Settings | Api Keys page, by clicking the 'Create' menu item. curl -H 'Authorization: Bearer eyJhbG...LBak' https://www.bulletinmessenger.net/api/3/sms/out --data "to=642715414141" --data "body=hi"
It is also possible to authenticate your user using HTTP Basic Auth. curl --user your-user-name:your-password https://www.bulletinmessenger.net/api/3/sms/out --data "to=642715414141" --data "body=hi"
curl https://www.bulletinmessenger.net/api/3/sms/out --data "userId=youruser-name" --data "password=your-password" --data "to=642715414141" --data "body=hi"
Don’t forget to use your password and an international-format number for the recipient, in the “to” parameter. User name for authentication (same as used for logging into the website). User name and password may be passed as form encoded parameters, or in the HTTP Authorization header in Basic format. The Message to send. Messages can be up to 480 characters long, although this can be controlled by fragmentationLimit. The allowable character set may vary depending on the destination network. In general characters from the GSM default character set are safe (see GSM 03.38). Set contentType to "text/plain; charset=UTF-16" to support richer alphabets. Your Message Source MSISDN that you wish to use so that recipients can identify you. Only numbers or source strings that you have registered against your account can be used. If undefined then the default value will be used from your account settings. An identifier that you can use to track message status information for retrying due to errors or delays. Maximum 36 characters. If undefined a UUID will be generated for you. Not valid with Virtual Numbers or Short Codes. Messenger will respond to each and every HTTP request with one of the following result codes, and an XML response in the body. It is important to note that the API may return a 200 Success result but still fail due to invalid contact name or possibly insufficient funds. You should get into the habit of checking the response XML for any issues in particular if sending to multiple recipients. The body of the response is an XML structure that provides more information about the send attempt. The following response indicates that processing was at least partially successful. The "salestem" error is likely due to a typo in the request, which should've been "salesteam". An inbound 'reply' message is received for your organisation. The status of an outbound message has changed (e.g. it has been received). Note that default values can be defined for your organisation from within Messenger, on the API Settings page, and only need to be defined when using the API if they need to vary from the defaults. Each time an appropriate event occurs, Messenger will call your provided URL. If your service returns an http result code in the 400+ range we will retry for up to 48 hours. To avoid duplicate messages being posted to your service we recommend you issue an http 200 status code. If the reply has NOT been successfully acknowledged within 48 hours it will be removed from the retry queue and can viewed on-line only. The currently supported delivery protocols are http POST, https POST, and, for callbackUrl only, mailto. Indicates the message that this reply is associated with. Either the messageId value returned in the /api/3/sms/out call, or a UUID allocated automatically by Messenger if /api/3/sms/out was not used. Not valid with Virtual Numbers or Short Codes. The body of the message that has been received. NO. If undefined will default to "RE:"
The http and https response sent to your callbackUrl, called when a message arrives for your Organisation, is available in two different formats. One is based on XML, and the other is an FORM POST format. The format used in the callback is defined by your Organisation on the Messenger, and are labelled "XMLv3" and "FORMv1". The phone number that sent the message. This is the messageId value returned in the /api/3/sms/out call, or a UUID allocated automatically by Messenger if /api/3/sms/out was not used. Blank if this is not a reply. Not valid with Virtual Numbers or Short Codes. The number of the handset that the status change is associated with. e.g. Who received the message. See Message Status Codes for simple descriptions of Codes used. A unique identifier for this status message. Check this ID to ensure you have not already processed this status update. More readable information about the Message Status, when available. Note: The order of the parameters may change so use value/pair matching rather than location mapping. The API allows Callback URLs to be defined individually when each message is sent, which is useful if you don't wish to use a Company default. Note: This does result in 'double' encoding of the mailto parameters if used. This is correct and required. You may obtain information about Messages and Statuses via our Polling API. Polling is 'firewall friendly' and often easier to implement (especially if you are working outside an HTTP server), but for the best experience we recommend Callbacks. Parse the results for the incoming message details as described below. No incoming messages. Pause processing and retry after 30 seconds. Polling will only transmit unread messages within the Messenger platform and mark them as read once transmitted. Remember this when testing. For 200 codes (success) Messenger will include a form encoded parameter list containing some or all of message information as described below. Messenger Unique ID. Check this ID to ensure you have not already processed this incoming message. The sender of the SMS message in International format. The number the message was sent to. Applies to MO messages messages only, not to reply messages. Matches the messageId returned to you in the response to /api/3/sms/out. If no messageId was set when you submitted the original message then this will contain 'default'. If the message is sent to a dedicated short code then the inReplyToId parameter will not be available even if it is a reply to a message you have sent from that short code (or virtual number) as they are still considered MO messages. Substitute your correct Messenger Credentials in this example and if you have any unread incoming messages available then you will download one of them if you access the URL in a browser. This shows the content of the request when the messages is not a reply but is an 'MO messages' message (ie: initiated by the handset). Note: the to value is included in the content while the inReplyToId is not included. Note: the inReplyToId which will map to the messageId you set in your original outbound message. To take advantage of 2-way SMS message threading ensure that you set a unique messageId in your outbound message and match it with the inReplyToId in the incoming message. You can not receive specific messages/replies using the API. Access the https://www.bulletinmessenger.net web site to view your incoming messages or use the Message Feed to access your Inbox using your code/application. You may obtain information about Messages and Statuses via our Polling API. All messages appear in this api. Each call to this API returns a list of messages sent since last polling date and then last polling date is updated with the latest polling date. Parse the results for the outgoing message details as described below. For 200 codes (success) Messenger will include JSON response containing some or all of message information as described below. Messenger Unique ID. Check this ID to ensure you have not already processed this outgoing message. The sender of the message in International format. The address the message was sent to. Applies to MT messages messages only, not to reply messages. Substitute your correct Messenger Credentials in this example and if you have any outgoing messages available then you will download a list of them if you access the URL in a browser. Messenger Unique ID. Check this ID to ensure you have not already processed this status update. The recipient number of an outbound message sent by you in International format. Matches the messageId returned to you in the response to /api/3/sms/out. If no messageId was set when you submitted the original message then this will contain 'default'. Not valid with Virtual Numbers or Short Codes. You may wish to view your recent messages in an RSS Reader, or your own custom application. Use secure HTTPS GET or POST to view such messages via https://www.bulletinmessenger.net/api/2/sms/list in either RSS or ATOM format. The maximum number of messages to return. Note that no more than 300 messages will be returned. Your application should parse the resulting XML feed and display or manipulate your recent messages. Details of your account including account balance, type and currency is included in the feed results. This will allow you to monitor your account status and initiate a payment before your service is restricted. To view an example of an ATOM feed, click here. To view an example of an RSS feed, click here.